Carter Law Group, LLC is a woman-owned law firm specializing in the representation and defense of businesses and individuals. The Firm provides legal services using a multicultural team providing greater value for our clients. The goal of this Firm is to build a different kind of workplace unencumbered by traditional barriers. The Firm is a culmination of multicultural people of a variety of abilities, skills, experiences and backgrounds to enable superior results and work product. We are a different type of law firm. Everything we do is driven by our commitment to our clients first. The Firm’s lawyers are well known for their ability in the courtroom and their representation of clients in litigation, toxic tort, insurance and catastrophic personal injury claims. Our lawyers have combined legal skills, business experience and aggressive advocacy to achieve our client’s objectives. Backed by a proven record of success, our lawyers are respected for their professional demeanor, skills in the courtroom and integrity as advocates. Our success is perhaps best measured by the passion and expertise we bring to our clients and the trust we’ve earned. 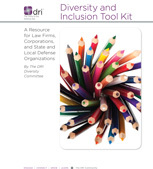 DOWNLOAD YOUR COPY OF THE DRI DIVERSITY AND INCLUSION TOOLKIT MANUAL TODAY!